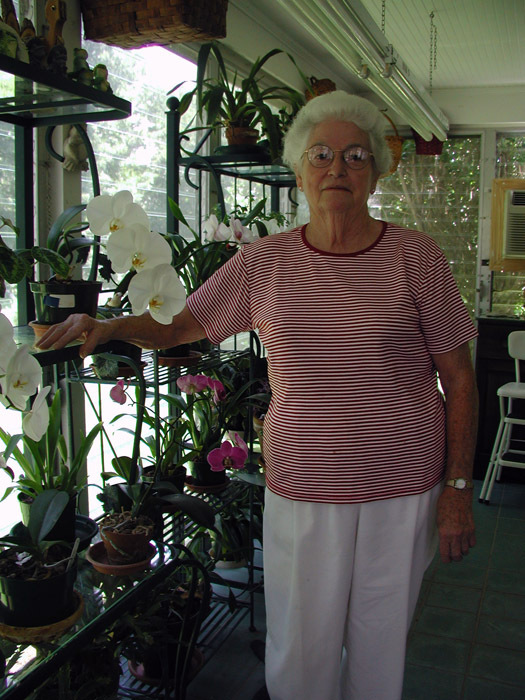 Virginia Lavinia (McCraw) Lumpkin is shown above tending her beloved orchids at her Scottsville home in 2003. Virginia was born July 6, 1924, on a farm in Buckingham County, Virginia, and is the daughter of Pearl (Hudgins) and Guy McCraw. 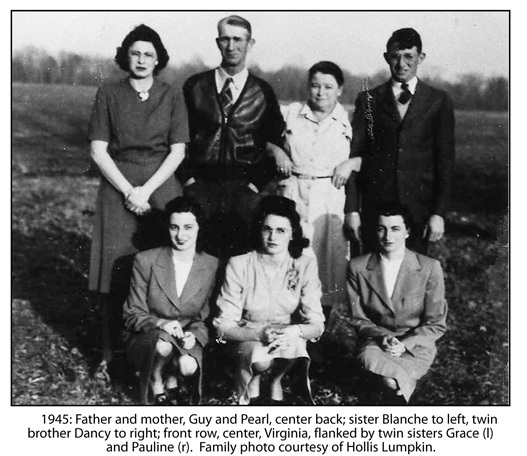 The McCraws were the parents of Blanche McCraw (b. 1916), Anna McCraw (b. 1917), Grace and Pauline McCraw (twins born June 24, 1921), and Virginia and her twin brother, Dancy McCraw. 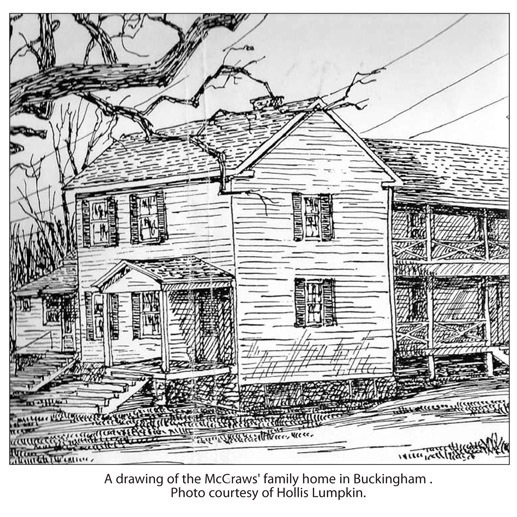 All of the McCraw children worked on the farm which grew tobacco and wheat and raised livestock. Virginia became her father's primary helper and in the process learned much about operating the farm business. After graduating from Buckingham High School, Virginia knew she needed to get a job off the farm. Her start began when she came to Scottsville in 1947 to care for her aunt, Mrs. Golladay, who underwent cataract surgery. Virginia's helping hand to her aunt was the beginning of a long career for Virginia in Scottsville. After Virginia's aunt recovered from her surgery, Virginia took a job working in Agnes Payne Beal's grocery store on Valley Street. The Beal grocery store sold meat and candy by the pound plus canned goods. Virginia continued to work at this grocery store until 1950 when she was offered a job at the Traveler's Rest Inn at the corner of Valley and Main Streets in Scottsville. As she describes the inn, "It had 17 bedrooms and served three meals a day. Most of the business was railroad people, Appalachian Electric, and salesmen." Traveler's Rest Inn. Postcard image courtesy of Virginia Lumpkin. Virginia met her future husband, Nelson Lumpkin, at the Traveler's Rest Inn. Nelson had started a business selling Jesse Jones sausage out of Danville and sold his products to the inn. After they got to know each other better, Virginia asked Nelson to come and help out with the inn. 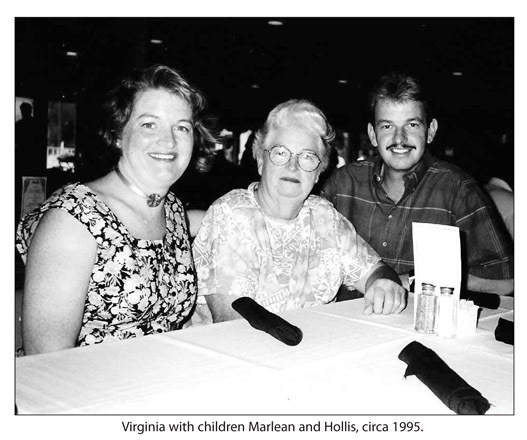 In 1955, Virginia married Nelson and together they had two children, Marlean and Hollis. Rather than have their children growing up in a hotel environment, Virginia wanted to give her kids a place to play. So the family moved to the rooms above what was then called Lee's Restaurant on Valley Street (located in the building that houses Amici's restaurant in 2015.) Virginia continued to work at Traveler's Rest, while Nelson helped out at Lee's restaurant when he could. In 1962, Mr. Lee was ready to turn over ownership of his restaurant and asked Virginia to buy it. The Lumpkins paid Mr. Lee an amount which he deemed to be sufficient over time. As business had dwindled at the inn, Virginia began working with Nelson at their new restaurant on Valley Street in 1962. As Virginia describes running Lee's Restaurant, "We just worked at it--it was hard. The restaurant is hard work, but it's made a living for me." It was a few years before Virginia and Nelson were able to pursue their dream of owning and operating their own establishment. They purchased almost an acre of land at the north edge of Scottsville and began construction on their motel/restaurant in 1969. Construction on Lumpkins Motel and Restaurant was completed in 1970, and Virginia and Nelson quit work at Lee's Restaurant after a year and put all of their effort into running Lumpkins in Scottsville. Nelson passed away in 1980, but Virginia continued working hard and succeeded at sending both of her children to college. In 2010, Lumpkins celebrated its 40th anniversary, and Hollis, Virginia's son is currently running the business and continuing his parents traditions of running a motel with excellent hospitality and a family-style restaurant with great service and food. The internet, with its temptations for snarkiness, does not necessarily seem a fair place for Scottsville to be judged. But out-of-towners who've eaten at Lumpkin's Restaurant and posted reviews on the website, Yelp, all get it: "the locals, food, and atmosphere were more than enough to make this a memorable experience"; "God Bless Mrs. Lumpkin and her family, she is wonderful, tells tons of stories and is still going strong�." "A cornerstone of the community and an old fashioned restaurant;" "It makes me happy." Virginia McCraw was born to a farming family in Buckingham County 91 years ago. The doctor who attended her mother at home was satisfied with the birth, ready to leave, when the midwife called him back for Virginia's twin brother, born a half-hour later. The family had two sets of twins, five girls and this one boy named Dancy. "I don't mind telling you-I haven't had an easy life," Virginia said on a recent sunny afternoon, resting at her home on James River Road with her two well-loved cats and the heel slice of bread with jelly. Virginia's most recent difficult experience was a dangerous bout of pneumonia that kept her in the hospital for a month, but her warm, forthright attitude has been restored, and she's glad to be home again. Virginia grew up as another boy on the farm, her father choosing her to be his primary helper. She credits him with "making me ornery and tough," which turned out to be helpful in her life. Her mother, Pearl, emigrated from Scotland to oversee land she owned near Dillwyn, VA. Pearl subsequently transferred her 600 acres of land ten miles from Dillwyn to Guy McCraw, the man she married. Virginia graduated from Buckingham High School at 18 with the assumption she'd get a job. A cousin then asked her to come to Scottsville to help nurse her mother, Virginia's aunt, Lavinia Virginia, and she replied, "Sure, I'll come over." This was the beginning of her long career in Scottsville. After cooking and caring for her aunt through the then-arduous process of cataract surgery, Virginia was surprised and gratified to be asked by Agnes Payne Beal-a relative of Lavinia-to work in her grocery store on Valley Street in Scottsville. "It made me feel good," Virginia remembers, still thinking of herself as a young country girl without special skills; all she thought she'd be able to do was clean the place, but she knew she could help. A neighbor drove her to the store daily, and at first she cleaned and stocked the shelves. Little by little she began waiting on customers, getting what they wanted (this was the Scottsville grocery with a crate of live chickens on the front sidewalk) but not ringing them up. Finally she learned to use the cash register, and she continued to work at Beal's "for years and years." One of the many stories that stud Virginia's reminiscences and give her great pleasure involves a small African American boy who helped Agnes. One afternoon, Virginia asked him to clean out the back room, and when he reported he had finished the job, Virginia inspected his work. She showed him what she meant by "clean out" and had him finish the job. Twice. When leaving work, the boy complained to Agnes Beal, "That's the meanest white woman ever crossed that bridge down there." Agnes laughed and gave him an extra dollar for his trouble. Virginia's high standards and strong work ethic allowed her to continue to support herself and live happily in Scottsville. She felt friendly with everyone, though she was careful. One day, Dr. Stinson asked Agnes if her assistant could take some time off; he then told Virginia that if she'd accompany him to Bruce's Drug Store for a Coke, he'd give her $50. She declined on the strength of the bad reputation associated with Dr. Stinson due to his abortion practice. He was amazed and pleased with her decision: "You're the first woman to ever turn me down!" Virginia left Agnes Beal's employ in 1950 when Agnes's own children were old enough to help her, and began working at the Traveler's Rest Hotel, a huge, rambling structure on the corner of Valley and Main in Scottsville that burned down in a 1976 arson fire. Virginia had learned all about running the 19-room hotel with a dining room that sat 60, from checking in guests to cooking and orchestrating the meals. Now she had begun to think of getting married and was looking only for a man who respected women, a "pleasant man with good manners towards women." Nelson Lumpkin, from Danville, was one of the salesmen who sold supplies to the Traveler's Rest Hotel. Virginia found in him the respect she demanded and companionship she desired. They were married April 9, 1955, and he opened doors for her "for the rest of his life"; they had two children, Marlean and Hollis. The Lumpkins socialized with Arbutus and Mayor Raymon Thacker and the Cohens, Rose and Milton, who ran "The Hub", a Scottsville clothing store vital to the women in town. The Hub offered everyday clothing, and Rose would make purchases in Baltimore for customers, who ordered a special Sunday outfit or a wedding dress. Virginia, Nelson, and other couples would attend dances at the Fireman's Hall (the Canal Warehouse) where the Scottsville Orchestra played Saturday nights. Virginia says she didn't dance, but would keep and pass out the private liquor people brought. Her husband liked to dance. At the Traveler's Rest, railroad workers and salesmen (drummers) were the main clients, as well as the crew which installed the natural gas pipeline in nearby Fluvanna County. 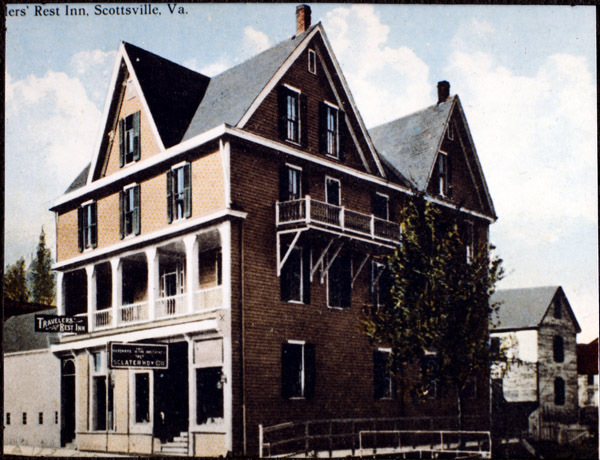 Other Scottsville enterprises which Virginia remembers from this time include the Pitts' grocery, Bruce's Drug Store, a liquor store, the Silver Grill restaurant, a dime store, furniture store, cleaners, three gas stations, and the movie house. Lee's Restaurant on Valley Street (located in the building now housing Amici's; "the restaurant in this building has never closed, it just goes hand to hand," Virginia observes) was run by "a really nice man," George Lee. In 1962 Lee was ready to turn over ownership of the restaurant. He came to the hotel, asked Virginia to accompany him to what he described as an auction of his place, and once there, handed her the keys to the business. She and Hollis paid him an amount he determined to be sufficient over time. 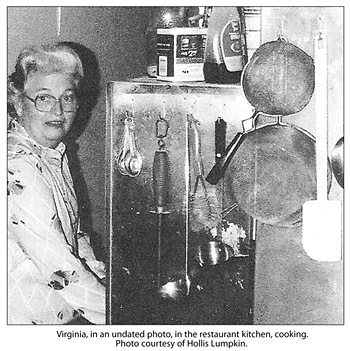 While Virginia continued to manage the hotel, Hollis ran the restaurant. A small story from the hotel days involves a pet flying squirrel Virginia kept, often in her blouse, but that sometimes got out and ran around the hotel. It was a favorite, and a great sadness when someone found it drowned in a toilet. The squirrel received a respectful burial behind the hotel. Many of Virginia's warmest memories of this time center on her dear friend, Edith Taggart, Scottsville's telephone operator. These stories of Edith have been often told and are collected on the Scottsville Museum's website. Edith had polio when she was eight and was left crippled. Her mother, Scottsville's Central before Edith, taught her to use the switchboard; Miss Edith became the voice, the eyes, and ears of the community, holding Scottsville together as the pace of life sped up. But forty years later, when switchboard technology was replaced by dial phones, Miss Edith "was thrown over," Virginia says, by the phone company, with no sensitivity or consideration. Virginia asked her "sweet and smart" friend to live with them at the hotel, answering the phone and helping guests, as well as assisting Virginia with the two children. Edith stayed Traveler's Rest the remainder of her life and is buried in Virginia's plot in the Scottsville Cemetery. After Miss Edith's death, the bank notified Virginia of a $1000 account she had saved for family. Virginia does not forget the strength and importance of that friendship. The Lumpkins stayed at the hotel until 1962, but as business dwindled, they moved to the apartment above Lee's Restaurant. They then bought almost an acre of land at the north edge of downtown Scottsville-all there was of town then-for their motel and restaurant. Virginia had inherited 75 acres of timber in Buckingham, and she cut it to raise money to build. She's "worked every day," she notes, being strict in raising her children after Nelson's death in 1980, and pleased she could send them to college, start them in their life's work. "I've enjoyed it." Virginia muses on hers and Scottsville's twentieth century, the developments and changes. She credits the loss of the tire plant as well as the high school with damaging the essence of the town, but she also says that things are more positive and pleasant, "nicer," in town now than mid-century. "Scottsville didn't have a very good name because of the drunks. There was a lot of moonshine in Scottsville when I came; a lot of drunks." She explains that you could see more drinking-or the effects of it-then than now. Men used to walk into town to drink on Saturdays. If they behaved, they were left alone. If not, the police took them home. She was told, when she took over Lee's Restaurant, to say nothing about the men drinking if "they didn't act bad." Another fact of Scottsville life was segregation. Lee's had a "Colored Only" room at the rear with its own entrance. Virginia got respect from the men there, she says, if she had to tell them to turn down the music; she also helped them with money to get home if needed, even food, and she felt they all had an understood relationship. One night a black soldier in uniform tried to encourage those in the back with a $100 bill to integrate the front room, but to a man, they declined. Life changed when the law changed. Virginia Lumpkin looks forward with pride to watching Hollis's children grow, to keeping up with friends, maybe getting her iris and peonies weeded. She takes comfort in Hollis's loving attention to her, as well as his success with the restaurant: "His desserts could make you slap your mama down!" Virginia Lumpkin, the grand marshal of Scottsville's Fourth of July parade in 2004, is still leading us all. Virginia Lumpkin in Anguilla in the Caribbean as a guest of her neighbors, the Strattons, in ca. 2000. Photo courtesy of Jean and Craig Stratton. 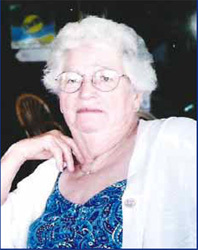 1) Oral History of Virginia Lavinia McCraw Lumpkin, July 08, 2003. Interview conducted by Monica Shenouda. 2) "Lordy! Lordy! Look What's 40" by Wendy Edwards, The Rural Virginian, April 07, 2010. 3) "Virginia McCraw Lumpkin Still Leading Scottsville" by Ruth Klippstein, Scottsville Monthly, October 2015.